Annual Summer Ice Cream Social ~ Sat, July 25, 2015 on the grounds of the Moses Wisner house. Michigan's 12th Governor, Moses Wisner, like the Lerich family, was an abolitionist. His barn was burned to protest his activity in the anti-slavery movement even though he was elected by a large majority. Rather than seek a second term, he turned his attention to organizing the 22nd Michigan Infantry, which trained at the Pontiac Fairgrounds. On August 25, 1862, the 22nd Michigan Infantry left Pontiac for Kentucky with Colonel Moses Wisner in command. Before leaving, Wisner conveyed the property on which Pine Grove is located to his wife, Angeolina. Colonel Wisner died of typhoid fever, January 5, 1863, in Kentucky while en route to the regiment's deployment. Yes, there will be much more than their card shows: Also included are Opening Ceremonies, local dignitaries, free Cake and Ice Cream, Veterans Mobile Service Center, Junior ROTC, a Curiosity Sale, Kid's crafts, Storytellers, and many other attractions. For more details, please contact OCPHS: office@ocphs.org Phone: 248-338-6732 (office is normally open Tues/Wed/Thurs from 11:00 AM to 4:00 PM). 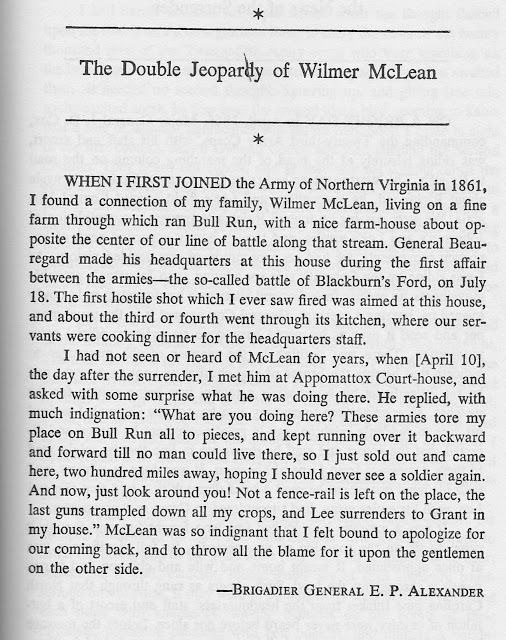 Of course the end of the sesquicentennial remembrance deserves at least a brief Public Domain story showing a more personal side of the war. That was part of an article in The Century Magazine, volume LXIII (April 1902) p. 931, by Brigadier General E.P.Alexander, C.S.A. 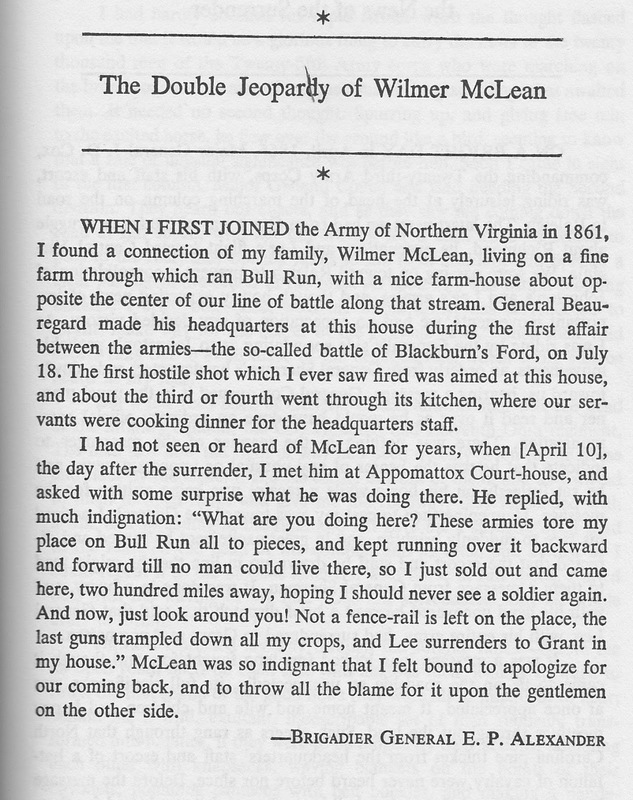 entitled "Lee at Appomattox: Personal Recollection of the Break-up of the Confederacy." It was included in A Civil War Treasury of Tales, Legends and Folklore edited and introduced by the folklorist B.A. Botkin. That book isn't Public Domain, but Botkin used Public Domain sources in his many thick volumes of folklore and in his work for the Federal Writers' Project, the Joint Committee on Folk Arts of the Works Progress Administration, and the Writers' Unit of the Library of Congress Project. That first link was Wikipedia, but another view of him is at New York Folklore Society's Journal, Voices. His work was analyzed in America's Folklorist: B.A. Botkin and American Culture edited by Lawrence Rodgers and Jerrold Hirsch. (That last link just gives you the book's Table of Contents in case you wish to read even more.) Benjamin Albert Botkin's anthologies are a great resource of Public Domain material even if their published format is under copyright for the total book. I was going to include his portrait photo and "About the Author" for his own view of himself, but instead recommend obtaining as many of his books as you can manage. There are PLENTY!